Not bad, but not particularly good. I debated over my first plane purchase. I wasn’t convinced I could appreciate a finer plane from Lie-Nielsen or Veritas, and from reading, the low-end options seem to often require quite a bit of work that I’m not familiar with. So, the WoodRiver low angle jack from my local Woodcraft seemed a good option. I found the plane immediately underwhelming—it just didn’t feel that great in my hand. Out of the box, the tote was very loose and had to be tightened. Trying to use it, I found the tote to be small in my hand. I don’t have big hands, but it wasn’t comfortable to hold. The mouth adjustment was rough and imprecise. After trying it a bit I pulled the blade out to sharpen it. I put the square to the blade and found that it was not square. I had never sharpened a plane blade before but have lots of experience sharpening other things, and after a while had a square blade that cut much better. Adjusting the blade was a challenge because the blade would shift a little in the mouth, requiring I crank down hard on the cap iron. Side to side, the plane’s sole was flat. But front-to-back there was a bow to it. I’m sure it was my imagination, but every time I looked at the plane I think the sole was more and more bowed. I didn’t measure the curve, but I came to believe I could see the bow with my naked eye and no straight edge. (And I didn’t yet have a way to flatten the sole.) One side of the sole was square, but the other was not. As I said, I was underwhelmed. Flattening the sole would have made the plane useful, I believe, but all of the other shortcomings made the decision to return it pretty easy for me. My experience with the WoodRiver also made the advantages of a Veritas bevel up jack clear (which I bought): a larger tote, set screws at the mouth, and a cap iron that didn’t needs to be cranked down were clear improvements; as well, the sole was flat and sides square. Sounds like you got a bad plane. I purchased the same plane well over a year ago and am very pleased with it’s performance and finish. I sharpened the blade to my liking and it works very well. I have one Lie Nielson plane and it is also a very good plane but it does not cut or perform any better than any of my other planes. My best performing plane is an old #3 Stanley Bailey that I bought from Ebay for $20. Bought 1 wood river plane, a L.A. 60 1/2 mouth casting not square and body had a slight twist. Better off buying old Stanleys and tuning them or spend the extra $ and get a Veritas on Lie Nielson, worth every Cent! Sounds like you could have induced some of the sole flatness issue by over tightening the lever cap. It really should not take much at all. That being said, I think you made a wise choice in going with the Veritas for only ~$50 more. This WR plane is terribly over priced compared to their other bench planes. 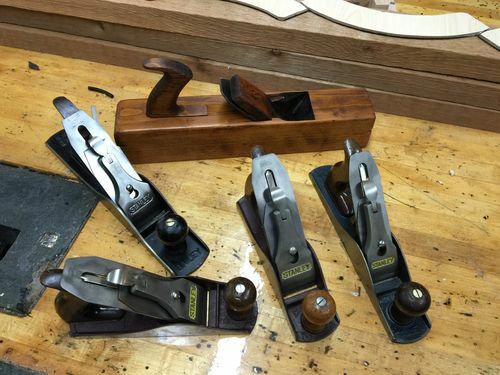 Good luck finding a vintage Stanley low angle jack plane for under $400. You’re better off going Lie- Nielson or Veritas for something like this. Very true, went with the Veritas® Low-Angle Smooth Plane and extremely happy. Not much use for a Jack plane so just use a Stanley 5 1/4 with a PMV-11 iron for any rough flattening. I have these on craigslist , think I might take them down. What was I thinking . For BU bench planes the Veritas models can’t be beat. Get the PM-V11 irons, they are well worth the few extra $’s. 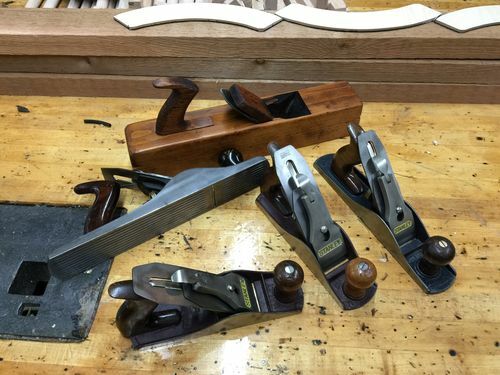 I don’t have a low-angle WoodRiver, But I have four WoodRiver V3 Bedrock style planes. NONE of them is bowed in anyway. The totes were too small though as you stated. However, years ago I bought one of the early WoodRivers and it was bowed. I simply returned it. Woodcraft will give you your money back. I was a big fan of WoodRiver when the prices were about half of Lie Nielsen. That has changed though. The WoodRiver low-angle jack is $199.00. The Lie Nielsen is low-angle jack is only $245.00. So here’s what I suggest. Return the WoodRiver right away. Take your money from the return, add $46.00 to it and buy the Lie Nielsen and then live happily ever after. That seems like it’s one of the knocks on woodriver. Some are great and some not so much. One of those, sometimes you get what you pay for deals. Hard to go wrong with a veritas or LN. Sold most of my Stanley’s for one LN 4-1/2. Sold the rest and now I have one #5 left for rough work and now have LN #7 on the way. I also have a veritas skew rabbet block and their flat and convex spokeshaves and a crapload of marking stuff. Between the two the quality is neck and neck. One is traditional style and the other is forward thinking.